Last week, we looked at architect Wang Shu, the most recent Pritzker Prize Laureate announced this month. Since it's been a topic in news outlets and blogs (or at least the architectural ones), we thought we'd share this infographic, conveying the background and history of architecture's annual prize that honors a living architect who has made 'significant contributions to humanity and the built environment'. 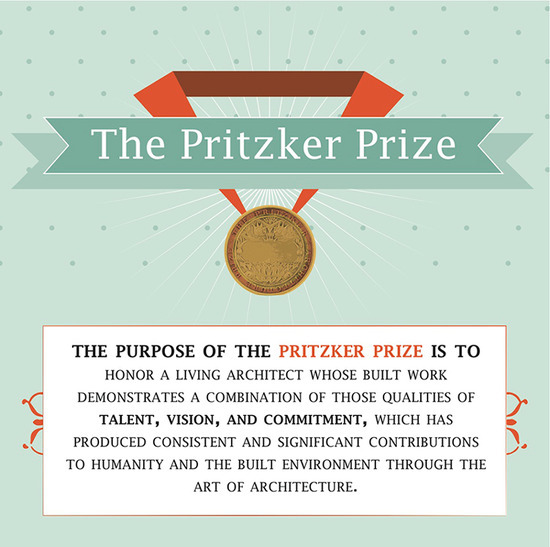 Click on the image below for the full infographic, including a timeline of every architect who has one the prize since its inception in 1979, with Philip Johnson selected as the first Laureate.